Striker Dennis was in Watford’s youth team in the early 80s but was released. 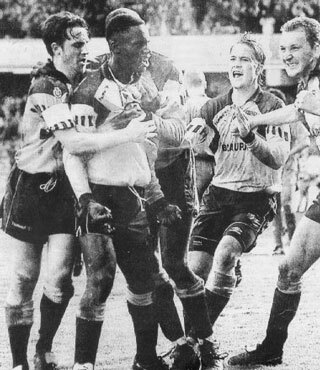 He returned to the club in 1994 on loan, making just eight appearances but scoring some vital goals as the club avoided relegation to the third tier. He also famously scored a hat-trick for QPR in a 4-1 win at Old Trafford on New Year’s Day in 1992. Now living and working in the Midlands, Watford Legends spoke to Dennis in 2011. Hi Dennis, thanks for talking to Watford Legends. You were plying your trade for QPR, so how did your move to the Vic come about? I was on the fringes of the first team at QPR and getting a few appearances on the bench and what have you but that was about it. I wasn’t exactly looking for a move but then I heard Watford were interested in getting a s striker in to try and help get them out of trouble and they were keen to get me, so I decided to give it a go. With Watford already being in deep trouble at that point, does that make it more tempting to make the move as you would effectively have nothing to lose? Yes it does. Every player wants to play as high as they can but first and foremost they want to play and the level Watford were playing at was still a good standard. Watford was local as well which was an added benefit as I didn’t have to live in a hotel. 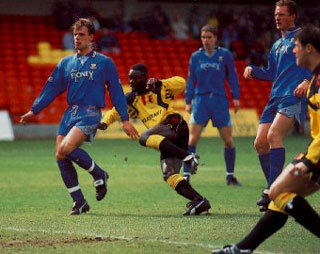 Also, I don’t know if you know this or not, but I was at Watford as a youth player before I got released. It was at the time when Graham Taylor and Tom Walley were at the club as part of the set up. So having been there as a youth player but being released it was nice to then be able to go back and show I could play at that level. I was genuinely surprised when I got released as a youngster as I was quite sure I had done enough to be taken on so it was a huge disappointment to me, so going back was great. Would you say you had a point to prove when you went back? No, it wasn’t like that. I was going back under completely different circumstances and though it was nice to go back it was about helping the club out rather than me proving a point. How did you enjoy the loan spell overall? It was good fun to be honest. When you are down the bottom and in trouble everyone pulls together and there seems a bit more unity to it and a team that is united is always a good one to be involved in. Tommy Mooney came in at the same time as me and we found that in training there was a good team spirit. We had to treat each game as a cup final and we had a few games that were real six pointers. So we were a team in trouble but I enjoyed my spell back there. There is one game that you will live long in the memory for, away at Peterborough. It was an amazing game. It swung one way, then the other, then the other! I remember it being an incredible game but I don’t remember much of the game itself if that makes sense. That game was certainly one of those six pointers and it was a great feeling to walk away with the points at the end of it and it must have been great for the fans that travelled that night as well. What was the feeling like when you saw your winning goal hit the back of the net? Fantastic, absolutely brilliant! In football everyone dreams of playing in the big games and playing at the highest level and not many get to achieve that. Whilst it wasn’t the highest level it was certainly a very big and important game. To play in it was great but to score the winner was the icing on the cake. To pop up in the last minute and score the winner was just perfect. Did you realise at the time how much you had become part for Watford folklore for scoring that goal, despite only playing a few games for the club? Anyone in football knows how much the game means to supporters, it meant a lot then as it means a lot now looking back as well as it was quite a big moment as the club could have got relegated. The thought of relegation was quite devastating for a lot of people so it is certainly nice to remembered that way and for that goal. I’ve seen a few mentions of that goal on the internet so yes, it is great to be remembered for that. Equally though it was a team effort to stave off relegation. To be honest with the team we had we should never have been down the bottom of the table anyway but as you know in football it doesn’t always work out that way. What are you doing with yourself nowadays? I’m a self-employed football coach and that is my main job if you like. I also do some work for my local Christian church which is in Solihull and I play football for my local football team so I am certainly keeping myself very busy. And to settle a debate, are you the last man to score a hat trick in the league at Old Trafford? Yes I am. Ronaldo scored a hat trick for Real Madrid in the Champions League there but I was the last man to do it in the league – that is my claim to fame!